Nagios is a powerful tool that allows you to monitor just about anything. It’s so easy to even take existing legacy system and adapt it to work with Nagios. When I came across kingkiwix and his blog here I wanted to repackage the content in a more user-friendly way for sharing. I wanted a solution that didn’t require me to pull in a bunch of development libraries and compilers. I also wanted a solution that I could re-use on other systems through a version controlled and packaged interface. Those running CentOS 7.x might be interested in this new blog entry: Nagios Core 4.x Setup for CentOS 7.x. something the tool you’re packaging does, you can feed RPMs patch files to accommodate it without obstructing the original authors intention. The use of nagiocmd user group. A /etc/nagios/conf.d directory to behave similar to how Apache works. I want to be able to drop configuration files into here and just have it work without re-adjusting configuration files. Alerting Apache on new updates/installs so just installing the package alone is all you need to do. Nagios Plugins should work right away once they are installed. Nagios Plugins and permissions should adapt to the new nagiocmd user and place in a common directory Nagios was already configured to look in. Nagios Plugins has to many dependencies; I wanted to break this up into separate packages for those who needed them. For example, I don’t use MySQL at all; so why should I need the MySQL Libraries installed on my system just to use Nagios Plugins. # to the software in question. At a minimum you need to install both Nagios Core (v4.2.0) and it’s accompanied Nagios Plugins (v1.5) package. and a patch to allow it to access a conf.d directory. Nagios Plugin RPM SPEC file. I Installed the Packages, Now What? The RPMs take care of just about everything for you, so there isn’t really much to do at this point. Yes, that’s right… you’re done! You can access your Nagios Web Interface by visiting http://localhost/nagios. How you configure your system further is beyond the scope of this tutorial/blog. My goal was just to get you started with an out of the box working Nagios solution :). If your not already familiar with Nagios, you may want to read the documentation so you can monitor more then just the 8 example checks it sets up for you out of the box. There are also some great web configuration tools you can check out as well here. Website is accessible at: http://localhost/nagios/ out of the box, but you can adjust it’s web configuration by adjusting /etc/httpd/conf.d/nagios.conf to your likings. Nagios Core 4 configuration file can be found at: /etc/nagios/nagios.cfg and a newly added /etc/nagios/conf.d/ directory has been added to make some things easier to add/remove later. NRPE is an addon that allows you to execute plugins on remote Linux/Unix hosts. This is useful if you need to monitor local resources/attributes like disk usage, CPU load, memory usage, etc. on a remote host. Similar functionality can be accomplished by using the check_by_ssh plugin, although it can impose a higher CPU load on the monitoring machine – especially if you are monitoring hundreds or thousands of hosts. 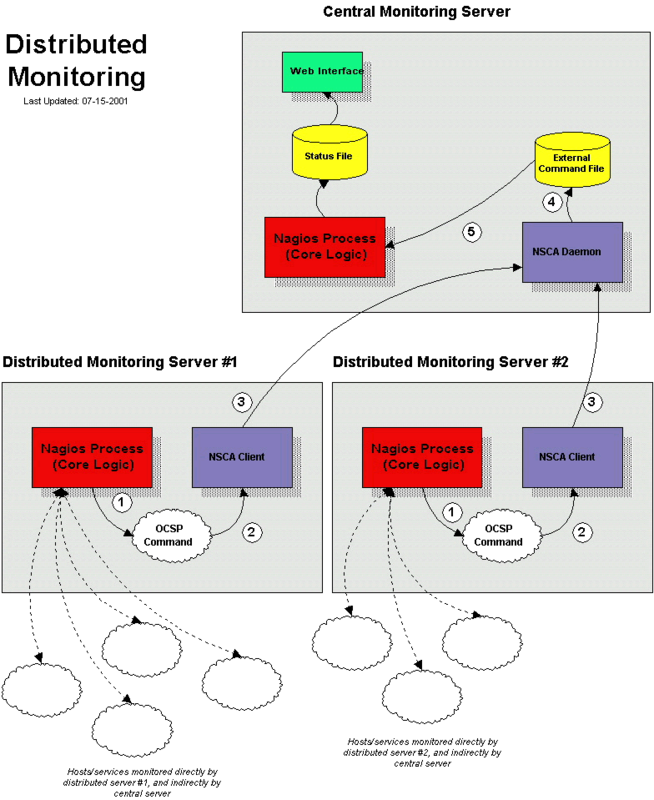 NSCA is an addon that allows you to send passive check results from remote Linux/Unix hosts to the Nagios daemon running on the monitoring server. This is very useful in distributed and redundant/failover monitoring setups. I’m considering packaging these as well to conform with the packages I’ve already provided here, but I’ll do that in another blog some other time if there ends up being a demand for it 🙂. Dec 8th, 2013 Update: I ended up creating this blog to extend this one: Configuring and Installing NRPE and NSCA into Nagios Core 4 on CentOS 6. This blog was inspired from kingkiwix&apos;s Blog: Install Nagios Core 4.0 on CentOS 6.4. This entry was posted in Linux HOWTO and tagged Centos, Monitoring, Nagios, Nagios Core, Nagios Plugins, Red Hat, RHEL on November 10, 2013 by l2g.